Home › Uncategorized › What did you do in the 80s, daddy? What did you do in the 80s, daddy? I had an interesting conversation with my daughter last night. She is 21, and has grown up with computers, the Internet and home videos. We got on the subject of where I worked when we lived in ATL. When we moved there in ’85 I was working for a multimedia company creating multiple projector slide shows. The photo above (found on Wikipedia) shows the setup for a new product launch by Ford back in 1987. Our company didn’t do many shows of this magnitude, but we did some presentations for Coke and Bellsouth (remember the Baby Bells?) that were 18+ projectors, some with film. I couldn’t get my daughter to imagine what this looked like, and why you wouldn’t just use video? How would you take a presentation like this to show to someone? Would they have to come to your office? I tried to explain the process. In the photo above, there is a reel to reel tape player. We put the soundtrack on 2 tracks of a 4 track tape. We would add a time track to #3 then program the projectors to turn on/off, flicker, etc. at certain times, using the time track. 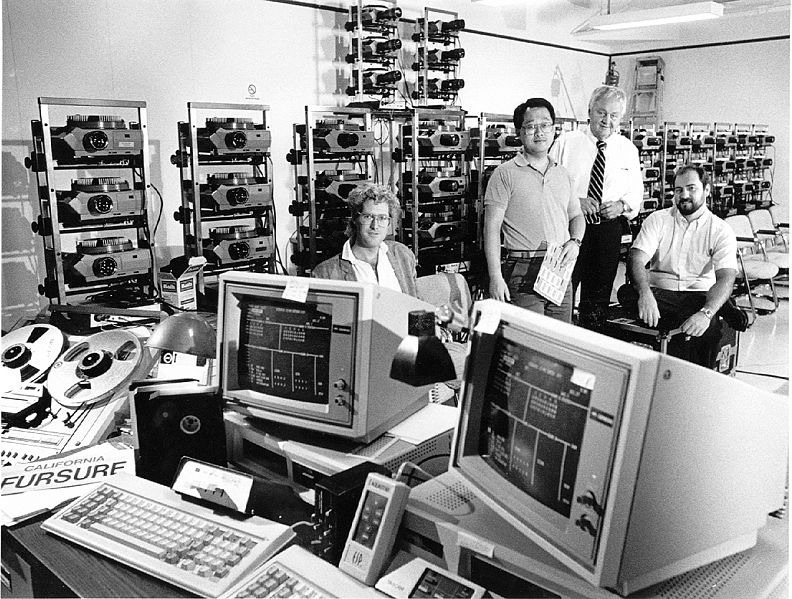 The computers in the photo were similar to the ones we used – running the DOS-based program used to program the projectors. To run the show, you would play the tape with the time track telling the computer to send signals to the projectors. I then explained that the software was created before there was a GUI interface. What’s that? she asked, as she was sitting at her Windows Vista laptop. What you’re looking at, my wife said. Did you have a mouse? No, just typing. After I worked in multimedia, I had several positions with a company that made mainframe software. We tried to explain this and dumb terminals to her, but this was an even harder concept to explain. Ah, the good old days. I remember the first computer my wife and I bought in the late 80s. A Kaypro, if I remember correctly, with a floppy drive, running DOS. With the printer, I think it cost $1500, maybe more. It is amazing for me to sit here with my iPad and think about how far we have come in the past 25 years. Our phones have more processing power than most of those old mainframes. My iPod holds thousands of songs and videos. Just incredible. I am fascinated to see what happens in the next 25, and if my daughter’s child will ask similar questions to her, like what’s a browser?